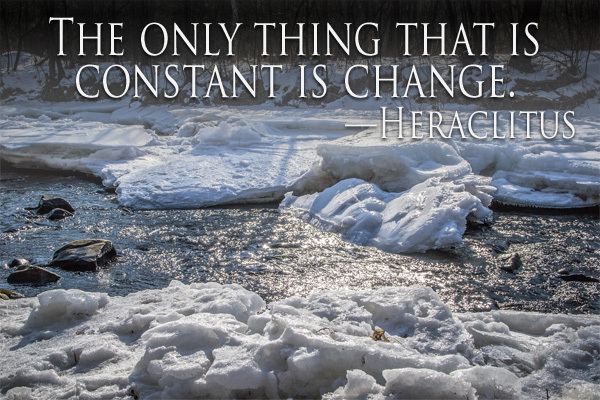 Heraclitus of Ephesus is quoted as saying, “The only thing that is constant is change.” He was ahead of his time. What you probably thought was a fairly contemporary quote was actually provided from someone who died in 475 BC! Enough with the history lesson, what has this got to do with volunteering? This month I want to consider the challenges of taking volunteers through a change process. As Bob Dylan put it, the times they are a-changin’ and volunteer-involving organisations are having to respond. Increased demand for services, decreasing funding, and a challenging external environment means more and more of us are having to change our approach to engaging and supporting volunteers. We’d better start swimmin’ or we’ll sink like a stone, to paraphrase Bob. Yet, while our organizations may be busy changing, are we remembering to help volunteers navigate those changes? About fifteen years ago I was involved in implementing a big change that affected volunteers. The organisation I was working for re-structured the paid staff team who supported our UK-wide, home-based fundraising volunteers. We went from a large team of staff across the UK who managed events and volunteers, to two smaller teams, one team focused on events and the other on volunteers. As a consequence: volunteers received more dedicated management support, 100% focused on volunteer issues; most volunteers kept their existing manager, but some ended up reporting to a new person; and some existing staff took the opportunity to take voluntary redundancy and/or retire, about which some volunteers got very angry since they erroneously thought the organisation was forcing people to leave against their will. We worked hard to explain the changes to volunteers. We put on a series of roadshow events so they could come and quiz me, the volunteer manager, as well as senior management about the rationale behind and benefits of the change. We attended volunteer meetings and sent out regular newsletters and emails to keep them informed. Our hard work paid off. Most volunteers accepted the change and went along with it. Even some who weren’t happy about losing their existing manager stuck with us, switching to a new support person, however reluctantly. But, some just wouldn’t accept why we were making the change. In any programme of change involving volunteers, we need to remember these words that were made famous by Abraham Lincoln. Not everyone will come along with us or see the benefits of the changes we are making. But why? As leaders of volunteer engagement, operating in our ever-changing global society, we need to remember this double-edged sword. Whilst our organisations and clients benefit from the focus volunteers bring to their work, it also means we must work hard to keep those volunteers informed of the wider issues and drivers of change, often when they show very little interest. We also have to remind our paid staff colleagues to communicate these reasons for change to the volunteers they work with. It takes a whole organisation to effectively involve volunteers and everyone needs to play their part in keeping volunteers informed and engaged. Crucially, we all need to remember that volunteers generally spend a lot less time working for us than paid staff do, so we cannot rely on the communication channels established for employees to work for volunteers. Whilst Tanya in accounts might spend 40 hours a week as an employee with us - and so pick up the messages about change quite quickly - Tanya’s volunteer Carlos is only here for two hours a week. He’d need come in for 20 weeks to accrue the same time in the office as Tanya, so it’s no surprise he misses opportunities to learn about what’s going on, like the water-cooler chats and team meetings that Tanya might take for granted. How have you managed change with volunteers? "It takes a whole organisation to effectively involve volunteers and everyone needs to play their part in keeping volunteers informed and engaged." Well said Rob. I have been amazed over the years seeing some organisations forgetting this golden rule. It goes to the value they place in volunteers. I have managed plenty of change with volunteers and staff and the key words are collaboration and feedback. Empower volunteers to have a genuine say and you are halfway there.